If you look closely, you can see Hoang sitting next to this massive mural of “Sparky” who, according to the dates on his collar, lived from 1975-1984. That’s a big dog rock. Okay, it’s not the classic roadside profile-view animals that I’ve been collecting pictures of, but I still think it’s worthy of CTMQ documentation. 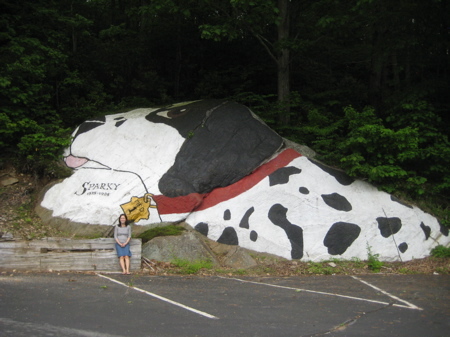 If your kids want to see a giant dalmatian paiting, it’s right off of I-395 in Montville at the fire station.